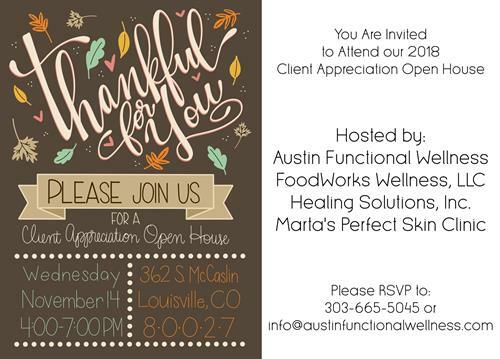 Please join Jen Simon of FoodWorks Wellness Nutrition Counseling and the other practitioners at Austin Functional Wellness for our annual open house event to celebrate our clients and community. There will be food, drinks, wine, giveaways, and good converstation! Please RSVP to the office at info@austinfunctionalwellness.com or 303-665-5405.